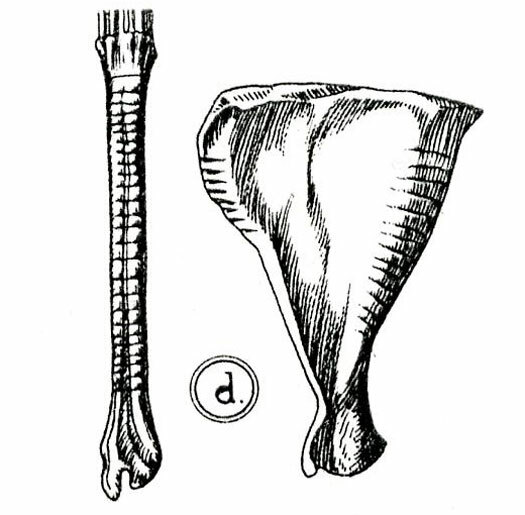 ’Nahuatl word for a musical instrument (rasp) consisting of a dried, striated deer bone or human femur that is scraped by a smaller bone to produce doleful sounds for the accompaniment of funeral dirges. Frequently laid above a resonator such as a conch shell or skull.’ To distinguish chicahuaztlis from omichicahuaztlis, see picture 1 (top and bottom rows, respectively). Strictly, we should classify the omichicahuaztli as a ‘friction idiophone’. Perhaps unsurprisingly, these terms - rather like our ‘shaker’ and ‘scraper’ - have become confused and sometimes interchanged by chroniclers and scholars. Stevenson documents very early examples of historians mistakenly referring to omichicahuaztils as sonajas (‘shakers’), as in the case of Hernando Alvarado Tezozomoc, grandson of Moctezuma II, when describing the funeral of Moctezuma I. 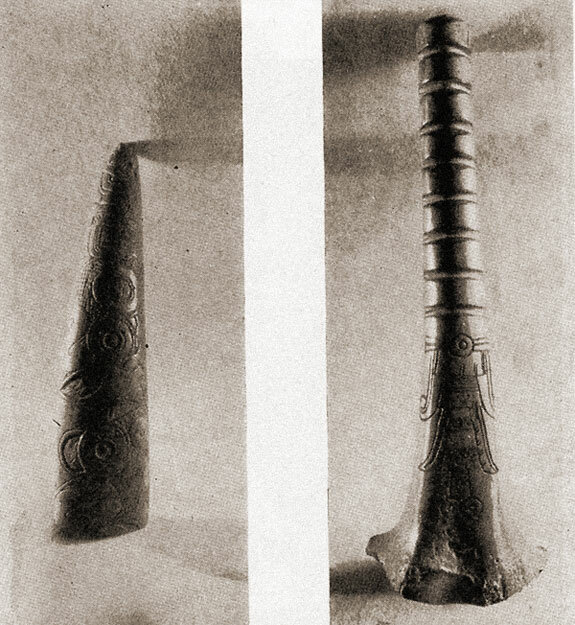 What is not in dispute is the use of these instruments prior to the Spanish invasion; 16th century chroniclers including Sahagún and Durán* mention them, and the renowned musicologist Samuel Martí, like Durán before him, claims that they were in widespread use in Mesoamerican cultures ‘with the exception of the Olmec’. However, context is everything. 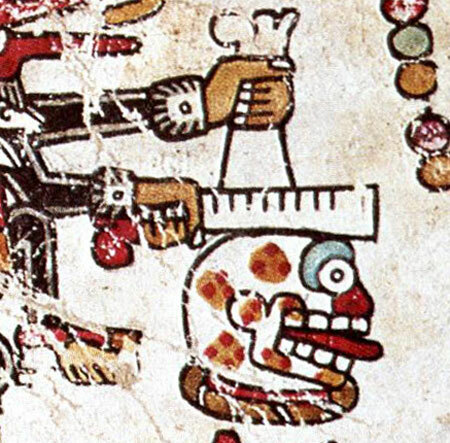 All the great scholars who have studied these instruments in the last two centuries - Seler, Nowotny, Beyer, Krickeberg, Caso, Martí, Stevenson, Castañeda, Mendoza, Contreras, for starters - agree that their use was restricted to accompanying funerary rites. ’Below [the two key figures] we see [bottom left] the mummy bundle ready for the fire. 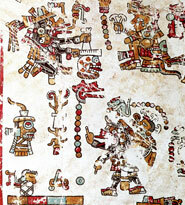 To increase its resonance Quetzalcóatl rests the notched bone on a skull. 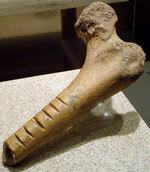 With one hand firmly grasping the notched femur, he rubs its grooves with a scraper held in his other hand. “Meanwhile he sings the ‘very sad song’ mentioned by Tezozomoc, the miccacuicatl, this threnody [lament] being symbolised by the glyph ascending from his open mouth”’ (the quote is from Beyer). 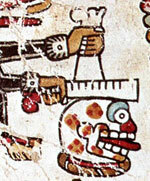 There is, incidentally, some disagreement as to who the character facing Quetzalcóatl and weeping (top right, picture 3) is; NOTE also a) that the skull rests on an icpalli, a reed ring ‘throne’ similar to those used to support two-toned tongue drums; b) that the skull itself COULD be artificial (Castañeda and Mendoza were convinced it was made of fired clay, similar to the example in picture 7); c) how sure can we be exactly how the instrument was ‘played’? ** and d) that the scribe appears to have mistakenly given Q two left hands! Whilst other materials have been in the past and are used today - deer bones, whale ribs, stone, clay and wood (Contreras) - by far the most common were human femur bones. 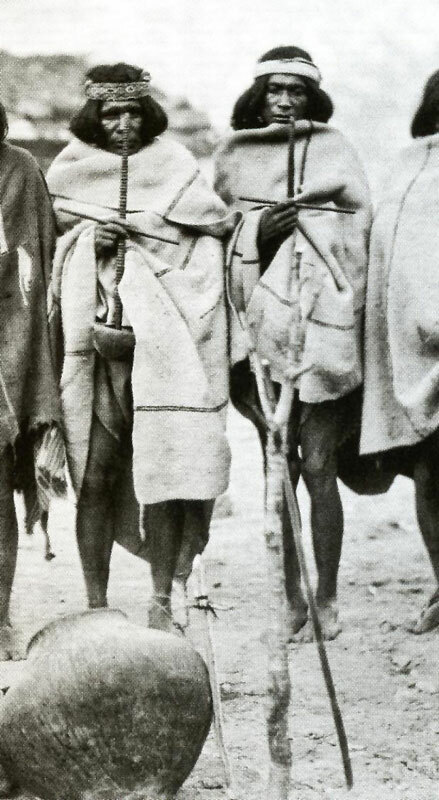 Choice of material may not have been arbitrary: Martí points out that use of bone, whether animal or human, was associated with growth and with magic, ‘ensuring life and resurrection.’ Deer continue to have religious associations among indigenous communities, representing the sun, vitality and fecundity. 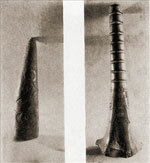 Martí goes on to mention the hallucinating effect of the scraper being played over a resonator, amplifying the hypnotic effect similar to that of scrapers repetitively accompanying traditional dances performed around the world. Coincidentally we should recall that in Mesoamerican belief systems, humans have three spirit centres - one in the heart, one in the liver and one in the head. 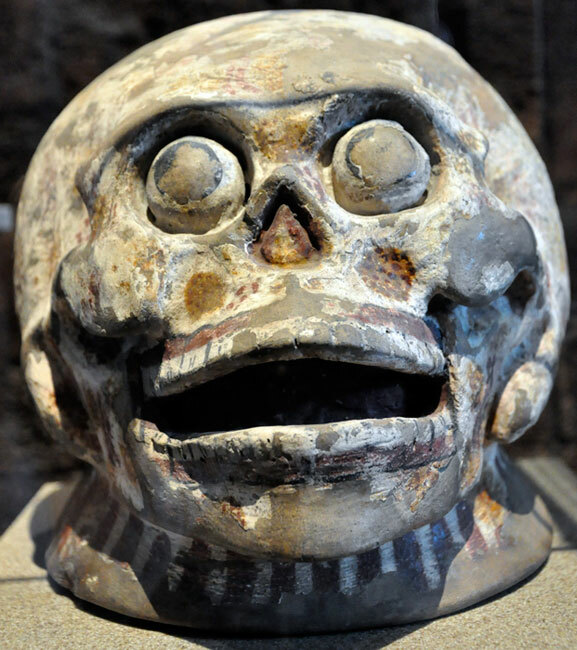 This also fits well with the notion that the skull rasp may have been ‘played’ to assist and energise the dead person on their long and difficult journey down to the underworld of Mictlan. • Pic 8: scanned from Esplendor del México Antiguo (see above). Q. 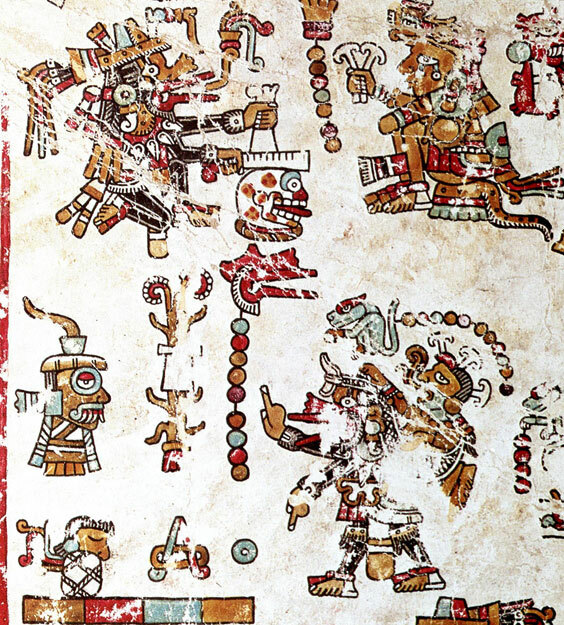 How were shamans formally rewarded and encouraged in ancient Mexico?